You might say it’s the trip of a lifetime. For this tour, however, you won’t want a new swimsuit or new shoes. There’s no long security line where you’re going, no expensive gas, squinchy seats or roadside food. You won’t need tickets or reservations but you’ve heard that the scenery is something to behold. It’s a trip you definitely can wait to take. Still, someday you’ll have to go – but will you come back? 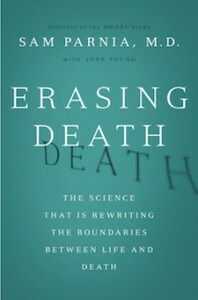 According to Sam Parnia, M.D., you might, and in his new book “Erasing Death” (with Josh Young), you’ll see how. Until recently, that’s all you had between the time your heart stopped and the belief that it was too late to resuscitate you. After ten minutes, it was thought that permanent damage to brain and body occurred, making it risky to bring you back. In most cases, you’d be considered dead. The key, he says, is to understand the dynamics of death. Cells don’t die at the same rate (which is how transplants are possible) and some can be put in a suspended state. Under the right conditions, if someone dies and treatment is given properly, it’s possible to see hours between death and life. The outcome – and the method of achieving it – depends on “zip-code lottery”: it ultimately comes down to the facility at which you’re treated. Post-resuscitation, patients have lots to tell. Most describe a sense of “calm and peace,” a bright light or lighted “being,” and a non-judgmental review of life. Even children contribute to what Parnia calls “actual-death experience” as opposed to a near-death experience. ADE, he says, is a more “accurate” term, since the patients have, technically-speaking, died. “Erasing Death” almost seemed to me like it could have been two books. With obvious excitement (and a lot of repetition), authors Sam Parnia, M.D. and Josh Young present cutting-edge science and new information that changes the way we look at illness, disease, and dying. I loved learning the possibilities that accompany these new findings. I didn’t love the lengthy anti-space-exploration rants here. The second half of this book deals with the time between death and life, which is really fascinating stuff but because there’s been so much written on the subject, I couldn’t help feeling like I’d read it all before. What I found most fascinating – and I wish there’d been more of it – was the research on coma patients, psyche, and consciousness. Overall, this isn’t a bad book but, considering the awe-inspiring information it presents, it’s not a stellar one, either. Still, if you want a basic understanding and can ignore its flaws, “Erasing Death” might be worth a tour.